Bats in Your Attic? Then Read This! Have you got bats in your attic? No, I don't mean the little furry black things that come out at Halloween. I mean the ones used to play cricket or baseball. Or maybe you have a load of old tennis rackets and basket balls up there instead? As it's a well-known fact that the attic is often the place that we use to store things that have no other place elsewhere in the home. Meaning it can get stuffed full of clutter and rubbish that we don't need, and generally drive us crazy as it can get so disorganised and messy! The problem is that it is filling storage space that could be utilized in a much better way. So to help you clear out the bats, and any other bits and pieces you no longer want and restore some order to the attic, keep reading. First, on the list of things to do is to steel yourself mentally for the task ahead. It's really no good going into this with a relaxed state of mind, as you really need to purge the stuff and get rid of it once and for all. Prepare yourself for this mentally beforehand, and you will be far more effective in getting your attic space clear. Next, attic spaces are not like the rest of the home. They may not even have boards down, and your stuff can be balanced precariously on beams, and stacked in corners. There can even be exposed insulation, as well as other allergens like dust to be wary of. So bear this in mind before you venture up there and get yourself a dust mask, and gloves. Also, wear long sleeved clothing and make sure you are aware of where is safe to tread and where isn't. Next, you need to be prepared to make snap decisions about what to keep and what to throw. If you are going to spend 30-minutes reminiscing over each item and deciding whether to keep it or not, an attic clear out job can stretch from a day into a week. That means as soon as you see something you need to know whether you will bin it or keep it, so learn to trust your first instinct! To make this process even more effective, it's critical that you not keep the things you have earmarked to dispose of around. They need to be got rid of immediately, so they don't end up going back in the attic again. Luckily, finding a cheap skip hire company will provide a quick and easy way to dispose of your waste so you can get it off of your property fast. Thus keeping the space clean and clear. Having a clean and clear space is something that is oh so important for the last stage of the process, as the space can be used for something meaningful, like an attic reading nook or guest room. Then you won't be able to fill it back up with stuff you no longer need and so keep it free of bats, rackets, nets, and everything else in the future. Let’s be perfectly honest: not every home smells sweet and irresistible all the time. In fact, you’ve probably experienced days when you’ve been wondering what the bad smell in your home was. The problem with houses is that bad odours can easily accumulate under the roof and slap you in the nose when you least expect it. However, most cases of bad smells can be treated with a little bit of cleaning magic. From the pet’s toys – and that include hunting gifts from your cat – to the leftovers in the fridge, sometimes all it takes is a little bit of cleaning up and ventilating to get your home smelling fresh and inviting again. But what can you do when it doesn’t work? It’s not uncommon for homes to facilitate the build up of damp patches.You might not even get to see the patches, but you can smell them. Sometimes the internal structure is responsible for the apparition of damp; sometimes it’s a problem with your internal air circulation. It doesn’t matter how often you open all your windows to let fresh air in. You need to install a sub floor ventilation system to get rid of floor dampness. And tada! You’ll get your home smelling fresh and dry again, and no more like a wet towel all the time. A minimalist decor refers to the art of decluttering your home. No more piles of unread books, crammed rooms, and unwanted furniture. Yes, a minimalist decor looks stylish. But do you know what it’s good at too? Not accumulating dust! Decluttering your home is by far the best way to get rid of old and musty smells. 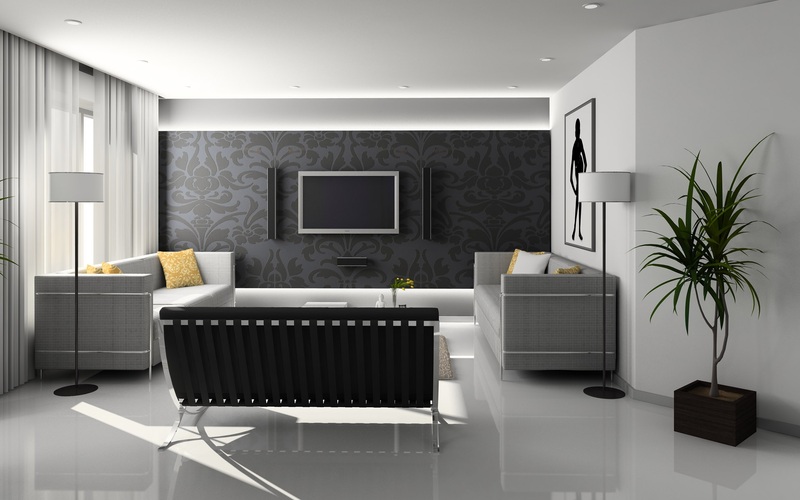 My word, your minimalist living room is an olfactive delight! Does the air smell clean to you? Have you noticed that sometimes your home harbours a chemical and unnatural smell? It doesn’t matter how many vases of flowers you put around the house, the smell still lingers. It’s because there are air pollutants in your home that are caused by processed materials in your furniture and chemical products. You’d be pleased to know that there are indoor plants that can get rid of these toxins for you. s Placing a peace lily in your lounge is not only a pretty addition but helps to remove formaldehyde, benzene, and trichloroethylene too. The bamboo palm has a similar action but also fights off air dryness indoors. Takeaways and packed food might sound appealing – and they sure taste good – but they create an addictive pattern in your brain. Everything will smell of that sticky BBQ sauce for days even though it’s only in your mind. Getting rid of the incriminating pizza box is not going to help. Instead, you need to train your mind to other food smells. How about baking a fresh batch of cookies or a sweet fruit pie and letting the smell travel through the rooms? Don’t struggle with unpleasant odours in your clean home. It’s time to tackle the invisible causes of bad smells from a structural issue to an addiction of the mind. Welcome to your home fresh home! First of all, if your garden has grown really quite wild, you’ll probably want to hire a skip bin from Takeaway Bins. You’ll need to spend a good weekend mowing your lawn, pruning your bushes and cutting any overgrown trees down to size. Place the waste into your takeaway bin, so that it’s safely out of the way as you start fixing your garden again. Once you’ve cleared away the worst of the overgrowth, you may notice that your borders and your lawn are starting to blend into one, which can look messy and unkempt, to say the least. The easiest way to do something about this is to add some form of edging, like the stuff from Form Boss, around the borders to clearly differentiate them. This simple change will get your garden looking more like an intentionally managed space, once again. If your lawn has been a bit overgrown for a while, chances are it hasn’t been fed and looked after much either. If you want it to look lush and green once again, instead of being brown, scorched and sick looking, you’ll need to feed it with a fertilizer that’s suitable for your lawn and the area you live in (a garden centre employee will be able to help you with this). Next, if you have fence around your garden, a decking area or even some garden furniture, which is looking a little worse for wear, if you don’t want to buy new, you’ll need to sand them down, prime them and then repaint/stain them so that they look as good as new again. Nothing brings down the tone of an otherwise pretty garden more than dank, dirty wooden features, so this really is an important part of the process. Once you’ve covered the basics, it’s time to have some fun making the garden, not only tidy but pretty once again. The most obvious, and effective, way to do this is with flowers. Plant colourful blooms in your borders, around your gazebo, in pots on your decking and anywhere else you think they’ll look fetching for an instant transformation. Transforming an overgrown garden is actually pretty simple, it just takes some hard work to clear out the old and bring in the new. If you’re prepared to so that, you can have a great looking garden in no time at all. Many real estate agents will tell you that the kitchen is your home’s most valuable asset. As so many families spend so much time in there cooking, eating and entertaining, it is often the first thing they look at when viewing a home, and a bad kitchen can turn them off making a purchase faster than almost anything else. That’s why it’s always worth spending a little money bringing your kitchen up to date from time to time. When it comes to your kitchen worktops, quality really does matter. Not only because quality worktops look a whole lot better than cheaper options like laminate, but also because they can stand up better to wear and tear. One of the biggest kitchen worktop trends right now is quartz. It’s strong, beautiful and just a bit different, which is exactly what you want in your kitchen. Kitchen tiles are, of course, a staple in most kitchens, because they’re just so practical. But if you choose patterned tiles, like those you might find in Morocco or Spain, they are also very beautiful, and you can use them to create your own works of art right there on your kitchen walls. Patterned tiles are a popular trend right now, which means there’s a bigger selection than ever before,and they’re much easier to find, so why not take advantage? Industrial design, especially in the kitchen, has blown up in the past couple of years, and although it is perhaps more popular in Europe than anywhere else, if you want to remodel your kitchen in dramatic fashion, adopting this trend which is characterised by rustic wood, stone, concrete and copper would be idea. In order to pull off this trend, you have to be willing to go a little minimalist, though, so if you like to have a lot of stuff in your kitchen, perhaps it isn’t for you. The kitchen is a messy place and a place where it’s easy to spread germs if you aren’t careful, so it’s probably not surprising that the latest trend in kitchen units is to do away with the handles, which are a prime breeding ground for nasties, completely. Units that can be gentles pressed when they need to be opened, not only help to fight the spread of germs ( you don’t have to touch them with your hands that have just been preparing raw chicken - an elbow or knee will do), but they also give the kitchen a sleek, minimalist look which can be quite pleasing to the eye. Kitchens which are decorated in shades of grey, black and white, with chrome accessories are another popular trend right now, and they are good for selling your kitchen because they stand out a bit more from the usual bright, sunny kitchens most people are used to. Changing up your kitchen to make it more on trend, as you can see, is actually not so difficult, but it is so worth it in terms of your own enjoyment and your home’s saleability. A Clever Way To Pay Off Your Mortgage Early! If you want to save tens of thousands of pounds over the lifetime of your mortgage, there’s one simple thing you need to do: pay it off early. In the first ten years or so of your home loan, much of the money you pay will be interest. And, while at the moment rates are relatively low, it’s still a huge extra burden to bear over the mortgage length. Now, I appreciate a lot of you might be struggling to make ends meet, and paying more each month for your house could seem like an impossible task. But it isn’t if you put your mind to it. In this guide, we’re going to go through everything you need to know about paying off a home loan early and save yourself an enormous amount of cash. Ready to get started? First of all, consult with your lender. Most banks will allow you to overpay by a certain amount each year, but because they are a little on the greedy side, they want to ensure they still get their pound of flesh. So, if you go over this overpayment limit, you can expect a charge. Using a little mathematics will soon tell you if this charge is worth it over the course of the mortgage, but if it is going to end up costing you more cash, it’s best to stick within your limit. While we’re on the subject of maths, let’s look at the sort of figures you could save. Assuming you have a 3% mortgage for $150,000 over 25 years. If you pay the standard monthly rate, by the end of the loan period, you will have spent $213,795 on that $150,000 home. However, if you could stump up an extra $100 a month, you will not only cut your interest payments by $12,000, but you’ll also have more than four years less to pay on your loan. Impressive, right? But where, exactly, can you find that cash? The chances are that your household runs OK on your budget. Sure, it would be nice to have a little more, but in truth, we can all live within our means. So, the next time you get a little windfall, put it in the best place - into your home. You won’t miss it, as it wasn’t available before, and your household spending won’t be affected at all. There are lots of ways we can all have money in the home when it comes to heating and power. You can save money with solar, insulate your loft and walls, and start making sure you turn everything off when it’s not in use. But one of the most practical - and easy - things you can do is switch suppliers. According to research, you can save hundreds of dollars over the course of a year just by filling out a form and moving providers. Combine switching with a more eco-friendly approach to energy use in the home, and that could be up to $50-60 a month already. Savvy shopping can cut your grocery bills by an astonishing amount. Meal planning, shopping at discount stores, and switching to unbranded food products can all add up to a lot of savings. According to statistics, Australian households spend up to $314 per week on groceries - and it wouldn’t be too hard to get that down by 50 bucks or so. And there you have it - an extra $100 into your mortgage account with virtually no trouble at all. Get that mortgage paid off! Most people are aware of home maintenance jobs like fixing the roof when tiles break during a storm. However, there are some things that almost every homeowner overlooks. Families that plan to relocate in the new future should do their buyers a favour by making sure they complete the tasks outlined in this article. Failure to do that could mean the new owners end up facing a lot of hassle when they first move into the property. Nobody deserves that at a time when they have to unpack and try to make the place feel like home. So, lend them a helping hand before the contracts get signed. Readers who remember to perform those maintenance tasks before placing their homes on the market might secure a quicker sale than those who don’t. However, at the very least, families can relax, safe in the knowledge they did everything possible to ensure the home is suitable for new owners. Of course, there are many other things sellers will need to think about, and so it’s wise to use some common sense throughout the entire process. Given that we tend to spend a gazillion dollars on renovations, remodels, and refurbishing our homes, it’s a little strange that one of the most important aspects - the lighting - is often forgotten about. That said, it’s not much of a surprise. After all, one person’s dingy hole is another’s dark and comfortable retreat - and there are certainly no hard and fast rules. However, whether you are looking for a bright and airy feel, or just want pockets of light for a more homely and relaxing feel, there are a few things you need to know. So, without further ado, let’s take a look at some illuminating guidelines for lighting the home. First, some science - and a quick look at the basics of lighting. Light is measured by ‘Lux’ and ‘Lumens.’ Without getting bogged down in the technicalities (and it is very technical! ), lumens describe the amount of light emitted by a bulb, while lux describes the level of light encountered in a room. In theory, one lumen equals one lux - but there are a lot of other factors to consider. The decor, size, shape, and colour of your room, furniture, and even your wall hangings will all result in some loss of light. So, buying a bulb that is high lumens won’t necessarily mean a bright and airy room - it all depends on those external factors. Confused? Don’t be. All you need to know is that the perfect lux level for each room depends on your needs. As an example, somewhere you relax will be more than comfortable with 120 lux, while a reading room or library (if you have one!) would need something like 200 lux. In comparison, a surgical theatre typically needs to be super bright to ensure clinical precision, and are often more than 1000 lux, while commercial buildings are often 500 lux. The key takeaway is this: if you decorate your room with dark colours, and that room is large, you will need a higher powered bulb to light it properly than you would in a small, brightly-coloured room. So, the size and colour of your rooms must be considered before you start investing in lights. As obvious as it may seem, few people take size into consideration, and will often buy lights that end up being overbearingly bright, or completely ineffective. Also, lighting a room effectively isn’t just a case of hanging the brightest bulb you can find, naked, from the light fitting. Lighting is decoration - pure and simple - and the larger the room you have, the more decoration you’ll need to consider. Again, some people love their homes flooded with natural light, while others prefer hiding away from the sun. That said, if you were to ask any estate agent about homes that sell quickly, almost every one of them would tell you that natural light is a key selling point. So, whether you are a natural light lover or a sun avoider, it’s probably worth thinking about how to get more natural light in your home. Not only will it help you get a higher selling price when it comes to moving on, but it is also healthy - exposure to natural light is essential for getting enough Vitamin D, improves your well-being, and even improves your concentration. But what if you live in a dark and dingy home, and want to increase your natural light? Don‘t panic - there is plenty you can do. First of all, take a good look around your garden and backyard area. Are there trees or tall bushes and shrubs blocking out the light? Trimming them back can leave the sun free to shine through your windows. Dark curtains and shades are also an obvious light block - as are dirty windows - so make sure you keep things lighter coloured, fresh looking and clean. You should also consider spending some serious time at your local design or furniture store - particularly in the mirror sections. Mirrors reflect light with almost zero loss, so if you are struggling with natural light, a few well-placed pieces will help you create the illusion of more light. Finally, homes with a lack of natural light will appear incredibly dingy if you use dark colours and hues for your decor. Using shades of white, pale greys, and bright, sunny colours will help the light bounce around your room with more aplomb. Moving on, some homes seem impossible to attract the right levels of natural light. Whether it’s due to all the windows facing the wrong way or just that they are small, it can be painful for those that would love a more airy and brighter room. But there is a solution. You can consider door replacement, either at the front or rear of your home and go for an all-glass finish instead of the traditional wood. You could knock through your external walls - if safe, of course! - and install sliding doors or something like French windows. Concerned about privacy? Don’t be - just choose a frosted or tinted option to finish the windows so no one can see in, but the light still floods through. Skylights are another excellent choice for lighting, although you need to bear in mind that they do come at significant cost. Not only are they expensive to install, but they aren’t very thermally efficient - heat can escape, and your heating bills will increase! OK, so now we have the basics out of the way, it’s time to take a closer look at your actual lighting options. There is plenty to choose from, but in essence, it all boils down to three distinct categories: fixed light; free standing; and special purpose lights. Fixed lighting is your primary source of light for each room, and it will differ depending on where you are in the home. For example, it’s likely that your living area or bedroom will have an opened or enclosed ceiling dome - or pendant lamp - that hangs down from the ceiling and is the focal point of every room. How you cover that ceiling dome is a question of personal choice, but you have the option of everything from a chandelier through to a simple, lightweight paper covering. In your kitchen and bathroom, you might have surface-mounted lights - spot- or strip lights, for example. There’s recessed lighting, too. This type of light is extremely discreet and very contemporary. They are usually built into the ceiling to provide illumination in large rooms with an interesting focal point or for those that want their furniture and decor to speak for themselves. However, while the primary light source of any room is important, it’s secondary lighting that helps brighten a room perfectly for any occasion. Floor lamps can reach the parts of a room that your primary light can’t reach - dark corners, or areas blocked by tall shelves and bookcases, for example. Table lamps can light up a work desk, allow you to read at night, and even instil an intimate atmosphere into any room. Try placing your table lamps at different levels of the room, and you can create a really atmospheric sense of warmth. Nightlights - with their soft and comforting glow - can provide your kids with a sense of security against the Boogeyman, without disturbing their sleep. And finally, you can consider arm lamps - perfect for studies or workspaces. If you really want to show off, however, then you should consider investing in some special purpose lighting. Accent lights can draw the eye to specific features of your home - and old, beautiful fireplace and mantle, for example. Background lights can act as a stand-in for natural light and are also a good backdrop for introducing various light effects. If you are into your psychedelic fashion, you can also think about using backlights - they are perfect for a futuristic setting, or whenever you need low-level lighting - such as watching your home cinema. So what, exactly, is the perfect lighting solution for your home? As you can see, it’s going to vary from room to room, but also person to person. As we discussed in the intro, there is no cut and dry approach, but there are a few simple tips you can use to ensure the special characteristics of our home are offset, highlighted, or contrasted with lighting. First of all, avoid harsh, bright lights in the bedroom. Soft, single shade ceiling lamps and some bedside table lamps are all you need. The living room, however, has multiple uses - from watching TV and reading, through to entertaining and general use, so you need to think a little carefully about your lighting. A dimmer switch for your main ceiling light will be a valuable tool, while floor lamps and table lamps spread about at different levels can provide wonderfully atmospheric effects - for cosy nights in or social occasions. The kitchen needs to be as bright as possible, so high luminosity spotlights - or even strip lights - are going to be useful in helping you keep your kitchen super clean and welcoming. You can also consider recessed lights - perhaps travelling all the way down your ceiling, and maybe even in walls near your prep areas. Finally, the worst area of your home to light well - the bathroom. You will need a bright and clear light for getting ready in the morning, and something far more relaxing in the evening when you are trying to unwind. Try using two different types of light to give yourself options - an enclosed dome or some recessed lights, and install some accent lighting for the times you just want to relax in the bath. We hope this guide has helped - leave any of your lighting suggestions in the comments!